"...In March 1945 Allied forces prepared for the final drive into Germany to end World War II. Standing in their way were the Rhine River and, on the opposite bank, desperate German defenders ready to fight to the last man. Operation Varsity--the last major airborne assault of World War II and the largest airborne assault of all time--began on the morning of March 24 when a fleet of Allied transport planes took off from air bases in France and England. In addition to towing more than 1,300 gliders, the planes carried some 17,000 paratroopers from two Allied divisions--the Red Devils of the British 6th Airborne Division and the Thunder from Heaven of the U.S. 17th Airborne Division. While the 6th had parachuted into battle on D-Day, the 17th had never jumped in combat before. Their mission was to drop behind enemy lines near Wesel, Germany, and gain a foothold for the Allied ground troops who would soon pour across the Rhine. The Germans had reinforced the area with antiaircraft artillery and greeted the invading armada with a firestorm of flak. Some Allied planes went down before troops could jump; others burned as paratroopers leapt from them. Upon hitting the ground, the soldiers regrouped, defeated sharp German resistance, and secured their objectives in the fields, forests, and villages around Wesel. 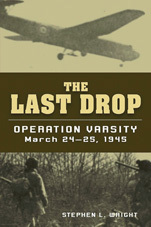 Drawing on war diaries, unit histories, after-action reports, and interviews with veterans, The Last Drop captures Operation Varsity as it was experienced by soldiers in the sky and on the ground, from the horrors of parachuting from a C-46 or flying a glider through bursting artillery fire to the mental and physical punishment of infantry combat..."
"...We were jumped by Mustangs with a big height advantage who proceeded to cut to ribbons the last three or four Schwärme of our formation in almost total radio silence! My attention was drawn to a muffled cry, barely audible in my earphones. I thought I heard the word “Mum”, but it was perhaps “Mustang”. I immediately shot a glance behind and saw, staggered back to the horizon, seven or eight palls of black smoke, which marked the sites where my comrades had plunged into the ground. I saw one them going down and impact in a ball of fire. The fact that I was flying in Rudi Zwesken’s Schwarm most probably saved my life. Just as we became aware of the drama being played out behind us, one or two very audible shouts of “Mustang!” shattered the radio silence. The two leading Schwärme broke hard and turned into the enemy fighters. I yoked my ship into a steep turn to starboard while switching on my gunsight and dropping my ventral tank. In such situations of “clear and present danger”, breaking hard to starboard was axiomatic, a sort of practiced routine. The enemy fighters almost certainly failed to follow me because of the surprise effect of this maneuver. Given the low altitude, the combat was brief. As my Schwarm had been split asunder, it was “every man for himself ..."
The mission was a disaster for JG 300 as the Focke Wulfs and Messerschmitts were cut to pieces by P-51s of the 353rd FG. 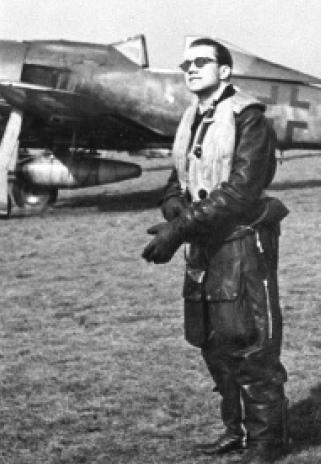 The few remaining fighter aces of the Sturmgruppe II./JG300 were killed including Fw. Ewald Preiß of 6./JG300 and Rudi Noske of 8./JG300. Of the 32 Focke-Wulf 190s airborne from Löbnitz, barely ten made it back to the airfield. 5. Staffel had lost six pilots. 6. Staffel had been literally wiped out during the encounter. If Lt. “Gustl” Sallfner’s 7. Staffel had returned largely unscathed, claiming two Mustangs shot down, the same could not be said of 8. Staffel. Two of its veteran pilots, Hptm. Kurt Loos and Fw. Rudi Noske, perished near Göttingen. The last Sturmgruppe defending the Reich had suffered irreplaceable losses.